Against the backdrop of a cricket loving nation gearing up to welcome the third season of India’s most extravagant cricketing bonanza the IPL-3, Nokia India and Kolkata Knight Riders (KKR) announced the ‘Main Bhi Coach’ consumer campaign. The consumer engagement program, unveiled jointly by Mr. D. Shivakumar, VP and Managing Director, Nokia India and Bollywoood super star Shahrukh Khan. 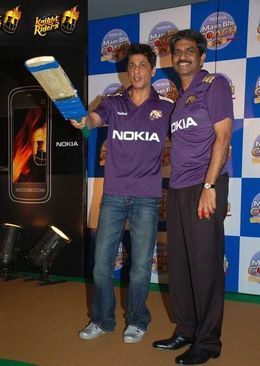 According to the SRK “Mai Bhi Coach (MBC) initiative is an innovative way to involve cricket lovers across the country to be a part of the IPL cricket action.This is a unique campaign that opens up an interactive channel between Nokia, KKR and its fans across the country. It lends a great opportunity for consumers to interact and perhaps even influence their team’s gameplay”. So if you have any advice or tips than you can send that just by one SMS to the KKR team on strategy, line-up, tactics, style, almost anything that can help clinch the title. All the SMS could be sent on mobile number 9664555555, and all these would be discussed with the team and the coach to see if the ideas could help in improving the team.The SMS charges will be depends on operators. The winning entries will get exciting prizes including an opportunity to spend time with the king of Bollywood, Shahrukh Khan on the sets of his latest movie. Nokia and Kolkata Knight Riders continue to strengthen their association and shared commitment to make IPL more exciting and engaging for Indian cricket fans. Main Bhi Coach is open for all cricket buffs and is not linked to the purchase of any product or service. Commenting on the association with Nokia, Shah Rukh Khan said “The Nokia-KKR association goes back a long way and further strengthens with every cricketing season. We share common beliefs and will continue to strengthen our relationship while giving our fans an entertaining cricketing experience.